The two week long colorful celebration of Ladakh, this harvest festival usually falls in September. The festival kick starts with a procession in Leh that moves through Leh market before finally coming to an end at Polo ground. This vibrant procession witnesses several cultural troupes and villagers participate in song and dance in their ceremonial costumes whilst the lamas of the sacred monasteries perform masked dances, there are polo contests, archery contests and wedding celebrations that add to the festivities of the festival. 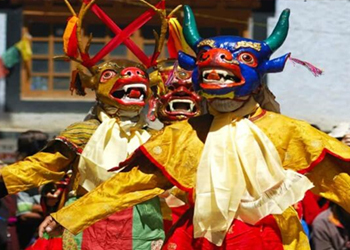 The Harvest festival is a blend of Asian, Tibetan and North Indian tradition that capture and depict the color of its customs, handicrafts and traditions through its theater shows, folk dances, music and dance.